Hello Again! I realize that my last post was back in June. Since then, summer was full of friends, family, volunteering, and I was revving up my blogging brain for new and exciting content. I can scarcely believe that we are going back to school soon. I am sitting at my desk today to catch up on life and get the calendar ready for fall and all that it includes. I plan to eat well, do some design work, and well, enjoy life. I am sad to see the summer go, but happy that a lot of busy-ness is past me. The fall will be full, but back to balance, which will include some reading, exercising, great food and music, and the usual fun friends, who are my extended family. So, good-bye summer and hello “fall” (in Texas, fall is really a week between Thanksgiving and Christmas, but who’s watching). 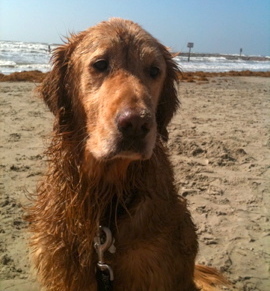 Photo above is my dog, Harley, showing a very sad face, that beach time will be limited in the coming months. See you back here soon with more posts on new fab restaurants with great food and design, and more surprises. Pots: I really don’t believe in non-stick. You can’t really use them at high temps as it will compromise the teflon finish. I think stainless steel (inside and out) is best. You need at least: 8” frying pan, 10-12” saute pan (with straight sides and a lid), small sauce pan, large sauce pan, dutch oven. Shop locally for what you want, what fits you best and is the right weight (if you can’t lift it, it’s not right for you). Buy the best you can afford. Shop online for the best prices as there are many suppliers out there. Storage: Good set of stackable plastic, long-lasting containers that you can use in the dish washer, freezer, refrigerator, and microwave. Cutting boards: have one that’s small and one that’s larger. Good to have one with a groove for catching juices. Must be able to put one in the dishwasher. I like a small plastic one, and a larger wooden one for carving meat. Utensils: wooden spoons (large and small), whisk, rolling pin, silicon spatulas, thin and flexible spatula, masher, grater, sieve, strainer, good sharp vegetable peeler, spreader, meat tenderizer/pounder, slotted spoon, garlic mincer, lemon reamer, ice cream scooper (the kind with a lever), sets of measuring spoons and cups, 2 and 4 cup Pyrex measuring cups, a roll of parchment paper, regular and heavy foil, good quality plastic wrap (don’t skimp on this), stainless steel scrubbies (they are effective on pots, gentile on china, and dishwasher friendly). Salt and Pepper Grinders: It’s essential to have a pepper mill with an adjustable grinder. Also, you need a good salt grinder for sea salt. It’s also good to have a lidded pot of salt for measuring. Additional: 2 heavy-duty sheet pans with silicon mats, roasting pan, smaller baking pans, large cooling rack and smaller cooling rack (good for hot pots), silicon oven-mits. Grapefruit spoons are wonderful for scraping seeds and pulp from the inside of produce, adjunct refrigerator (if you’re lucky to have one). I believe this list is fairly comprehensive. To my loyal readers, chime in and add anything to the list you see fit. Most items are multi-purpose. Be creative. 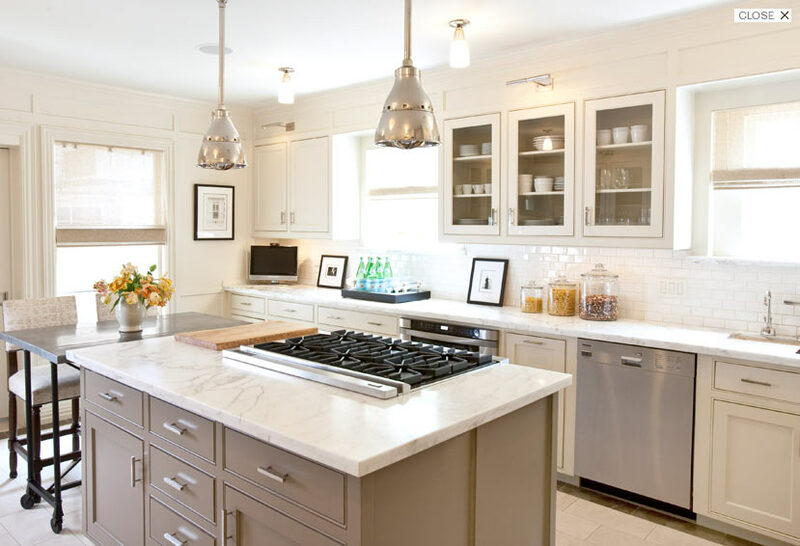 You will find that you really need less than you expect, for a fully functional kitchen. I have thoughts on the edible pantry, which will come later, so stay tuned. Every Labor Day weekend, it’s become a tradition for me to make ribs (one of my dad’s favorites). My version uses short ribs. Meaty and gelatinous, they are knife and fork warm-weather food. The day before, I braise them, low and slow, for about 4 hours, till they fall off the bone. I remove the bones and transfer them to a canister, the juice separate, but reserved. When ready to serve, you can leave the ribs whole, or pull them, adding the sauce, and use on buns or on flour tortillas for breakfast with eggs (oh baby). I love tweaking recipes that I find. I generally cook “freehand” (pinch of this and a handful of that). I’ve been criticized for not being able to reproduce what I’ve made before. I see the kitchen as a blank canvas. Embrace the difference each time! BUT, I managed to get down the perfect BBQ sauce recipe and everyone loves it. While the ribs are braising, I make the BBQ sauce. I know, I know, you’ve read a thousand recipes for sauce before, but this one is special, I assure you. It’s not too icky-sweet, and not too spicy, JUUUUST right. You are hereby licensed to take liberties…(you just have to report back with your results = deal). The day of the event, I remove the ribs from fridge and let them sit for a couple of hours, becoming room temp. Once room temperature, I dip them in the sauce and reheat at 300 degrees for 30 minutes. It’s chic and yummy. 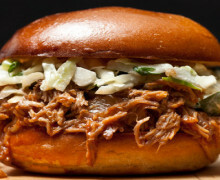 Serve with slaw and tater salad (is there any other way?). Saute one large sweet onion, till caramelized and medium brown. Set aside to cool. In a blender add the cooked and cooled onion. Add all other ingredients. Blend well. Refrigerate. Make ahead; it will taste better the next day. Photo courtesy of Tom Bohannon, one of my mates at Foodie.com. It just made my mouth water to see this. I often wonder why it is that the home and food are so important to me. I think it’s that they both “feed” and nurture us (at least they do for me). To me, design gives a house more than just a pretty picture to others. It should be a reflection of who the users are. I say users, because not all of us own our places of living. I love to travel, but I love to be home, in my bathrobe, at peace. I feel secure and comfortable where I am. There’s no view or spectacular landscape. My place feels and smells like me. It’s familiar and a respite for me when life is icky. It’s a wonderful space to entertain a few friends. I am flattered when someone feels comfortable enough to take their shoes off and put their feet on the coffee table, or plump the pillows on the sofa to fit their own bodies, as if they are in their own home. I think we all like a sense of place and belonging. 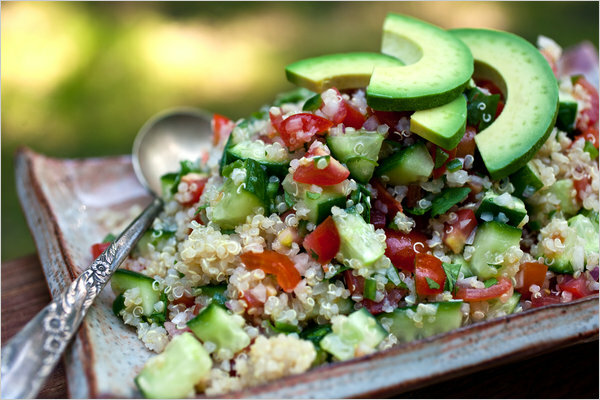 Food nurtures our souls and hearts, not just our bodies. Granted, some take it to extremes, but the passion and effort many make to eat well for health and enjoyment is amazing. On the average we spend 13% of our income and 10% of our time eating and drinking. That’s quite a lot of effort made to fuel ourselves. 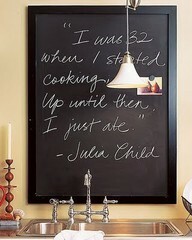 Of course, I certainly eat to thrive, but I also love to cook and dine. For me, it’s part of the art of life and enjoyment of living. The process of cooking, taking something and turning it into art and sustainment is so fulfilling. They say we “eat with our eyes first”. A lovely place to eat where you feel comfortable, eating good things, and in the company of loved ones, surely must be one of the best things we can enjoy. 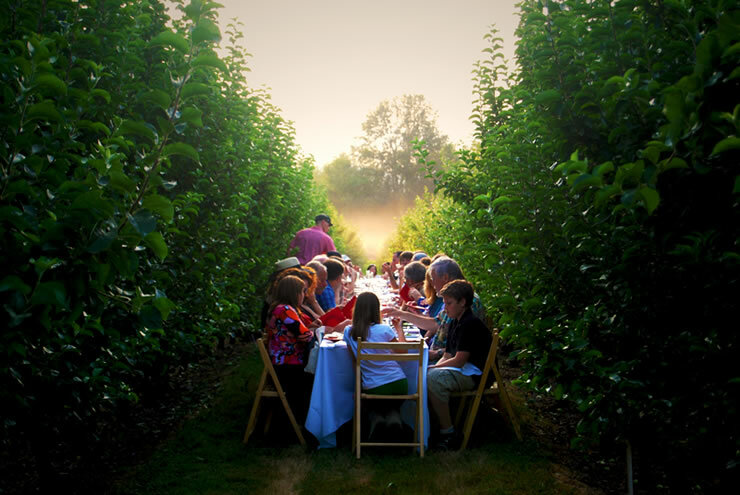 Photo courtesy of Outstanding in the Field, which, if you haven’t enjoyed one of their events, well, you just haven’t lived. Learn more HERE. I have fallen (become obsessed, really) with Pinterest. If you don’t know what it is, it’s another social media site, which enables you to share photos that interest you. Since we are all visual here, you will appreciate it’s ability to stimulate the ocular senses. Nearly anything you want to see is displayed, so don’t by shy about what you search for. You can also share your own images with the world by uploading them to the site. Share your joy and follow “friends” through other social media sites you might be engaged in. There are smart phone and tablet apps available, so you can carry your new-found addiction to Pinterest anywhere. P.S. Please don’t hate me because this is wonderful… Lines at the grocery store were never so fun! Hello World and WELCOME to our new page! We hope to share all sorts of great interior design and foodie finds. Stay tuned for more!